My Funny Garden is all about your own garden. Plant vegetables, fruit and flowers on your fields, cook and bake delicious food from it and so become the best gardener ever! A total of 40 different species of plants and over 30 manufacturable products are waiting for you. You have a maximum of 7 fields in which you can grow fruits, vegetables and flowers. Create various delicious dishes, spices, oils, cakes and jam from your harvest in order to sell them in the restaurant. Receive many challenging tasks to improve your reputation among the inhabitants of Garderia and get unique rewards. Compete with other players to see who is the greatest farmer of all time. Explore different types of plants and new production opportunities, so that the crops on your fields are even more effective. The reference for My Funny Garden with useful tips and overviews of the various buildings and products. My Funny Garden is a cute and carefully created farm game. Compared to other games of its genre My Funny Garden includes additionally the further processing of all cultivated products to delicious meals, bouquets, perfumes and oils. With a total of 40 different species of plants and over 30 manufacturable products, 9 meadows and fields, 3 different sales opportunities, a funfair with lottery tickets, a research laboratory, the guildhall, the marketplace and the supermarket you never get bored, as there are always things to do. Additionally various quests provide diversion and challenge. At the beginning a tutorial will introduce you to the basic game content. Advanced players will also have the opportunity to join together in guilds to face even greater challenges together. So what are you waiting for? 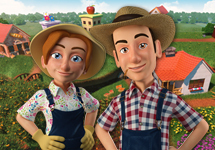 Immerse yourself in the wonderful world of My Funny Garden and become the largest farmer of all time.